I don't think it's at all controversial to say that most people my age wish, to some degree or other, that we could live in the world of Harry Potter. 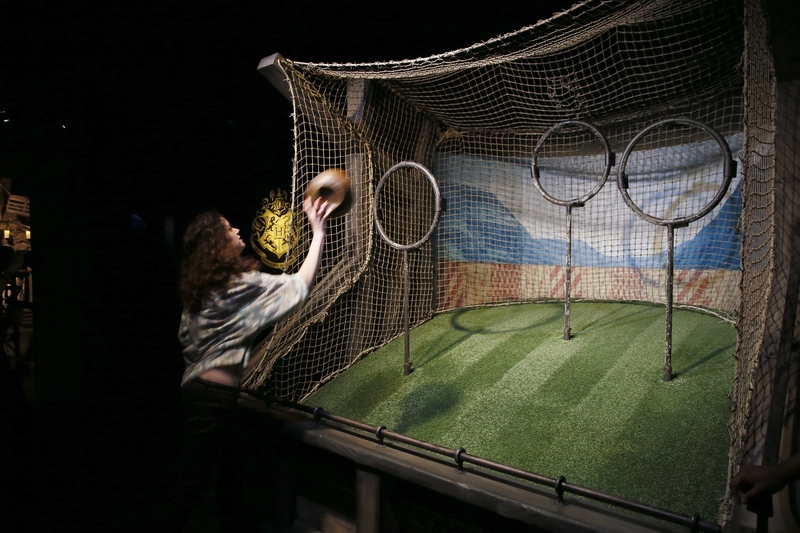 Why else are people holding events like a real, live international Quidditch tournament? Yes, that's right, Quidditch isn't just something that one oddball club on your campus does, it's also something that happens in international tournaments. The surprising thing, though, really isn't that such an event was held, but that us muggles aren't staging more of them. Despite the fact that the final Harry Potter book was released in 2007, and the final movie came out in 2010, love for the series has not died down at all. People still make Potter- themed remixes and share quotes and eat Bertie Botts Every Flavor Beans and attend Harry Potter conventions. There's even a whole wizarding world theme park in Orlando, because that's how much we all wish we had gotten our Hogwarts acceptance letter and been able to take our place in the world of magic. But since we all seem to be stuck as muggles, we've learned to make do. Still, there is always more we could be doing. And so in the spirit of the European Quidditch tournament that just concluded, here are 8 other wizarding world events that someone should definitely put on. Yes, they'd probably be less fun if they just involve running with a broom between your legs as opposed to flying, but they're also easy to organize. So there's really no excuse for not having them. This one is a little more ambitious, and would require a lot more organization, and I'm not sure how'd you re-create the dragons, but I would definitely love to see people go on diving expeditions or try to navigate a booby-trapped maze, all for the glory of their school. I'd even settle for the whole thing only taking a weekend as opposed to a whole year. The Weird Sisters are one of the most popular musical acts in the wizarding world, and appeared in the Goblet of Fire film, introduced simply as "The band that needs no introduction!" (though that might have had more to with legal issues involving a Canadian band, the Wyrd Sisters). I vote they reunite again to serande us muggles this time. I will also accept a concert by Celestina Warbeck, another magical musical legend, who did not appear in the film and therefore is a role that can be filled by anyone. Someone make this happen. This one might be more difficult, due to the logistics of muggles not having real magic to duel with, but I trust the people who do special effects and illusions to set something up for me. Maybe source this out to an enterprising theater department? If you stage it, I'll buy a ticket. Gilderoy Lockhart might have lost his memory when his own memory charm backfired in The Chamber of Secrets but as we find out in later books, he is still rather keen on signing his own name. So it would be wholly in keeping for him to make some appearances for us poor muggles and sign our copies of the second Harry Potter book (the one in which he is the Defense Against the Dark Arts teacher). Hopefully no one will leave with all the bones in their arm removed. Yes, schools have winter dances already, but I want one with magical ice decorations. This doesn't seem too much to ask. The action in the seventh book ends not long after the climactic battle for Hogwarts, but you know that there will be celebrations and memorials marking the day. And I think that Harry Potter fans need that as much as the wizarding world. The battle took place on May 2nd, so someone mark that date down and start organizing something to both commemorate all the beloved characters who died in the series and also the triumph of good over evil. Anyone who can rig up some Weasley's Wildfire Wizz-Bangs fireworks is my all-time hero. Now that we have a European league organized, it seems only right that the World Cup be next. We can al camp out in tents that are bigger on the inside and wear mismatched muggle clothes because we just don't know any better (anyone who goes around as Archie in his nightgown is the best). It'll be great.